We want to raise fish with feed produced in Kagoshima.Our Amberjack eat Green tea and Shochu lees. 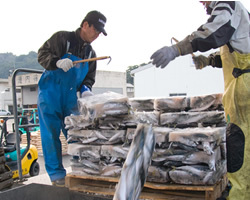 Feed for UMI-NO-OHKAN is frozen feed (anchovy, horse mackerel, mackerel, etc) which has an extra formula feed added and hardened into pellets in order to lessen the effect on the fishery grounds. 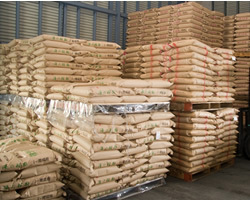 We use our original feed to maintain high quality and consistent production. One of the characteristics of formula feed is that it is mixed with green tea produced in Kagoshima. Green tea keeps amberjack fresh, increases their vitamin E, and reduces cholesterol content. The result of a sensory test proves that it also reduces the fishy smell and makes the fish body clear. Vitamin E, having an immunoenhancing effect, is necessary for fish. It prevents arteriosclerosis, cerebral strokes and cardiac infarctions. It also helps to stop the oxidation of food, which spoils its taste and causes bad health (diabetes and cancer). Mixed with formula feed, shochu lees are now friendly to the environment since they were previously dumped into the sea. They also have a good effect on cholesterol-reduction, anti-ageing, fatigue relief and antibacterial action.